This special order machine is just like the standard model 19 except it also has both of the grinding attachments (Stone and the stainless steel grinding attachment). Available in 12 different colors. To view colors please check out our home page. Manual handle is sold separately. The two way switch is also available for this motor for the additional $79.95. Suggested retail price is $1389.95 To customize your needs, we also stock (4) four different types of grinding attachments and rollers for different types of grains and seeds (almonds, masa, tortillas, large field corn, beans etc). The funnel neck diameter are also available in 1 inch, and 1.25 inch for larger grains, such as corn, bean, etc. If you can specify the type of material you want to grind before you purchase your mill we will make sure to send the correct attachment with your mill. Please do not hesitate to call or e-mail us if you have any questions or have a specific application in mind. 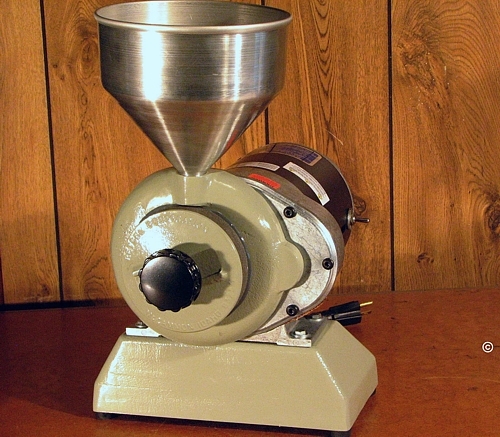 This mill is a special order item, therefore it may not be purchased with a credit card. A 50% restocking fee will apply to all Mil-masters returned for refund within 30 days of purchase. There will be no refunds issued after 30 days of receipt of this special order item. It can be purchased with a check or money order only. To process your order, please choose this machine from our shopping cart, select the check/money order option, print and forward your order to us in the mail. Once we receive your order in the mail, we will e-mail you a confirmation. All our products are made in USA. Due to our strict quality control standards and supplier manufacturing deadlines our delivery time may vary depending on which color and item you select. The standard delivery time on all our products, repairs and special order items is 2 to 10 weeks at this time. Please call us at 208-254-3737 during our regular business hours before placing your order to find what our current delivery schedule is at this time.